Finding the VIN plate is the first step. The 1964 1/2 – 1966 models had their VIN numbers stamped under the hood on the inner fenders edge of the driver side fender, 1968 models display the VIN at the base of the front windshield where it meets the dash on the passenger side while later models display the VIN on the driver side. There is also the “secret” VIN number which is actually hidden under the right hand fender towards the cowl area, again on the inner fender. This was a feature to stop the VIN numbers being ground of and re-stamped if stolen for example. When all the VIN numbers, and door tags match up with the engine block and transmission numbers this is what is known as the “Matching Numbers” car. If you have a matching numbers car then you have a rare beast indeed and increases the value significantly. The VIN decode follows a basic standard. 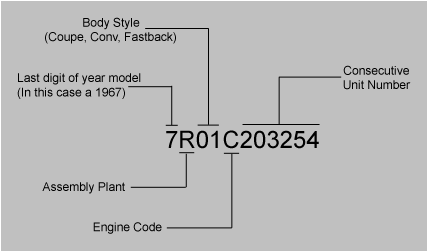 From left to right the first digit is the last digit of the model year, the code for the assembly plant (1 digit), body style (2 digits), engine code (1 digit), followed by the consecutive unit number. Each model year has some variation on the Mustang parts; the model years are decoded below. Key – This is not intended to be a definitive list for your vehicle as there are many online decoders which will do that job for you and give you a more acurate decode. Hopefully this will cover the more common codes to give you an example of how it works. 100005=Consecutive unit number – the order this Mustang was built in the factory. The Door Tags are usually located on the left hand door or drivers side. It’s important to check the authenticity as the door tag or warranty plate may not be the same one that originally came on the car. i.e. the door was changed after an accident. Compare the Door Tag to the vehicle VIN plate (and owner documents) to the one under the hood (65-67) or on the dash (68-73) to determine if the plate is indeed the original door tag. The door tag contains lots of information around trim, colour, axle, transmission options at the time, but perhaps more importantly the actual date the vehicle was built. In fact all the information about your car can be derived from this plate as the vehicle VIN number should be match this tag. The door tags changed designs over the years, however the information contained on them was the same format. I don’t need to explain too much about these tags as they speak for themselves, the only quick bit of information is around the DSO. DSO stands for “Domestic Special Order”, Units built on a “Domestic Special Order”, Foreign Special order, or other special orders will have the complete order number in this space. Also to appear in this space is the two-digit code number of the District which ordered the car. This DSO is often (incorrectly) refered to as the “District Sales Office” as well. There is a charge for the service but it’s worth it. This website will also be able to supply you with exact replica Door Tags if you need to change the door or has become damaged. There is a holy grail that a few Mustang owners have found when they picked their cars up from new but not realising it at the time; known as the “Build Sheet”. This single document followed the car around the various factory areas as a log if you like, on where the car has been and what options are required on that vehicle etc etc. These were removed from the cars prior to dispatch and thrown away, but sometimes they were stuffed in glove boxes, on top of glove boxes, under the dash, in the wire loom, under the seats front and back, under carpets, behind the firewall padding, down the “A” pillar voids, in fact it could be anywhere they could hide it. The sheets varied a little from plant to plant and years, but essentially hold they hold the same details or build requirements. These pieces of paper are rare and there are only a few pictures around, so thanks to Google (of course) here are some examples. Common place for a build sheet. Who would look behind the seat backs for a build sheet? If you have an early mustang 1964 – 1966 and you have the matching build sheet; congratulations. You have just added a bag of money to that car as that is the only way to prove the exact provenance of the vehicle as it left the factory. In fact any build sheet will add a nice provenance to your car as well as that pot of gold! Taken from various sources and modified for my page. I do not see any build sheet examples.